Morula plucks a branch from one of her favorite snacks, a bush-willow. She holds the stem in her teeth, wraps her trunk from right to left around the branch, and sheers off leaves, top-to-bottom with a single swipe. She drops the branch and transfers the leaves from the curl of her trunk into her mouth. Morula is right-trunked, as I am right-handed, preferring to grab and wrap from the right. Thembi is also right-trunked, but Jabu’s a lefty. One of the ways to determine an elephant’s dominant tendencies is to inspect the underside of its trunk for green stains on either the right side or the left. But before you do this, make sure you know the elephant and, more importantly, the elephant knows you. Morula peels and discards branch after branch. Shredded bushes mark her path. She pauses next to a candle-pod acacia, easily recognizable by its upright seedpods. It reminds me of a giant leafy candelabrum, holding a hundred or more candles in ruffled tiers. Sharp curved thorns protect each pod. Morula strips the acacia of a branch, then puts it in her mouth and eats it, thorns, pods and all. She sidles close to Doug and curls her trunk against her forehead. A light breeze feathers the hair in her ears as she stands slightly sideways and nods the tipof her trunk in a tiny Hello. . . Ribbed muscles cross the underside of her trunk. Bristles stick out like the legs of a giant centipede. There is no other living creature on this planet that has a trunk. If elephants were already extinct, which brave paleontologist would go out on a limb and reconstruct the trunk just from evidence of bony nostrils high on the skull? Who could imagine a nose dangling close to the ground where scents abound? A nose with the ability to pick up a single straw, rip a tree out by its roots, bench-press 600 pounds and untie your shoelaces without you ever noticing? “Stand here,” Doug commands me. I obey, my back to an elephant lineup. With a little guidance from Doug, Thembi gently places the tip of her trunk on top of my head. It feels like a big beanbag up there, but one that’s warm, wiggly, drooling and breathing. 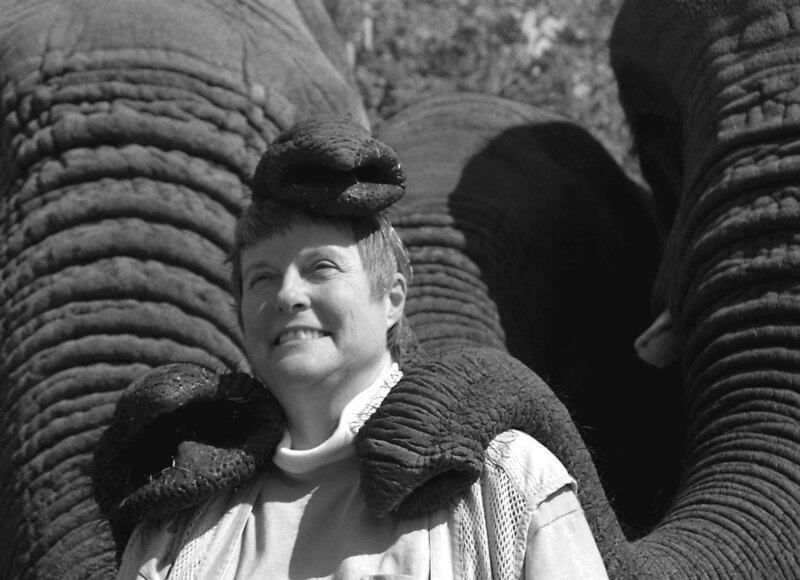 As Thembi rubs nose slime into my hair, Doug places Jabu’s trunk tip on my right shoulder and then Morula’s on my left. Jabu has trouble keeping his trunk balanced on such a narrow ledge. He constantly fidgets and pokes my cheek with his bristles. Morula’s trunk drapes over my shoulder like a slack hose with a dripping nozzle. Her runny nose continuously drains to clear out inhaled dust – the common condition of all elephant trunks. When I look down and to the left, I have a close-up view of the two “fingers” on her trunk. Her top finger is more pointed than the one on the bottom. The shape of it reminds me of a hooded cobra. But perhaps that’s because I think of Morula’s trunk as thinner and “snakier” than Jabu’s spectacular snout. Which is getting heavier by the moment. With the peripheral vision in my right eye, I see two nostrils dotted with grains of moist sand, nostrils more flesh-colored than gray. Each opening is nearly as wide as the “O” of my mouth. All three trunk tips, I can attest, are not just sheer weights. They sniff, snorf, squirm, wiggle, inhale and exhale. They create an atmosphere of elephant breath around my head. The weights disappear. For a few steps I am oddly light, as if walking on the surface of the moon. There is an elsewhere, somewhere, but it’s not a place I want to be right now. Even with that elephant breath that is pretty darn cool.